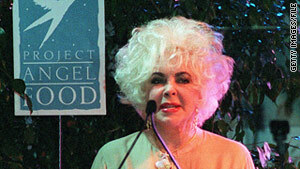 Elizabeth Taylor received the Angel Award from Project Angel Food for her work with AIDS patients in 1999. Tonight, don't miss a tribute to Elizabeth Taylor on a special edition of "Piers Morgan Tonight" at 9 ET on CNN, followed by an hourlong look back at the screen legend's life on "The Joy Behar Show" at 10 ET on HLN. (CNN) -- In the early 1980s, Elizabeth Taylor stepped up when others were afraid. A mysterious disease was taking the lives of many gay men, and there was fear and uncertainty about how it was being transmitted. But the movie star refused to treat HIV/AIDS sufferers like lepers. "Everyone was talking about AIDS, but talking behind their hands," Taylor said in a BBC Omnibus Special profile that aired in 2000. "But nobody was doing anything about it, including myself. And then I got really angry." Taylor's activism made her an international spokeswoman for the fight against HIV/AIDS. Now, the iconic star is as revered for her charity work in that battle as she is for her shining moments on the screen. "Dame Elizabeth was without doubt one of the most inspirational figures in the fight against AIDS," said a statement released Wednesday by the American Foundation for AIDS Research (amfAR). "She was among the first to speak out on behalf of people living with HIV when others reacted with fear and often outright hostility." More than a quarter of a century ago, Taylor became one of the first high-profile celebrities to become involved with AIDS Project Los Angeles, which in the early 1980s began holding an annual dinner to raise money for those with the disease. "People were telling me not to get involved, I got death threats, I got angrier and angrier," Taylor said in 2000. "So I put myself out there." Taylor's commitment to HIV/AIDS activism further took root after her close friend, actor Rock Hudson, died of the disease in 1985. The pair had starred together in the iconic 1956 film "Giant." "This is something that is a catastrophe that belongs to all of us," Taylor said at the time of the fight against HIV/AIDS. "It isn't a thing that belongs to a minority group any longer." The year Hudson died, Taylor joined with Dr. Mathilde Krim as well as a group of physicians and scientists to form amfAR. At the time of her death, she was the organization's founding international chairman, according to the group's Web site. In 1991, she established The Elizabeth Taylor AIDS Foundation, which focused on providing direct services for people living with AIDS and funding to AIDS service organizations. Over the years, Taylor raised millions of dollars through her activism and attracted many of her celebrity friends to also become involved. She supported several major events, including Cinema Against AIDS, which takes place annually at the Cannes International Film Festival; and Unforgettable: Fashion of the Oscars, a benefit auction to which she donated the gown she wore to present the Oscar for best picture in 1969. Taylor often shared a message of love and acceptance for the gay community, which had been so harshly affected by the disease. "Why shouldn't gay people be able to live as open and freely as everybody else?" Taylor said in 2000 during her acceptance speech at the 11th Annual GLAAD Media Awards. "What it comes down to, ultimately, is love. How can anything bad come out of love? The bad stuff comes out of mistrust, misunderstanding and, God knows, from hate and from ignorance." With the announcement of her death Wednesday, accolades flowed for her tireless charity work. "Today, the lesbian, gay, bisexual and transgender community lost an extraordinary ally in the movement for full equality," said Jarrett Barrios, president of The Gay & Lesbian Alliance Against Defamation (GLAAD). "At a time when so many living with HIV/AIDS were invisible, Dame Taylor fearlessly raised her voice to speak out against injustice. Dame Taylor was an icon not only in Hollywood, but in the LGBT community where she worked to ensure that everyone was treated with the respect and dignity we all deserve." "For 25 years, Dame Elizabeth has been a passionate advocate of AIDS research, treatment and care," said the statement from amfAR. "She has testified eloquently on Capitol Hill, while raising millions of dollars for amfAR. Dame Elizabeth's compassion, radiance, and generosity of spirit will be greatly missed by us all. She leaves a monumental legacy that has improved and extended millions of lives and will enrich countless more for generations to come." "Elizabeth, thank you for all your help in the battle against HIV and AIDS," basketball legend Magic Johnson tweeted. "You will be missed by the world." In February, amfAR honored Taylor with the Award of Courage at the group's 25th annual black-tie benefit. The actress was unable to attend, but singer-songwriter Elton John accepted the award on Taylor's behalf. Sir Elton also sent Taylor's regards and congratulations to two fellow awards recipients: former President Bill Clinton and designer Diane von Furstenberg. "I am there in spirit and I join you in saluting my fellow honorees and all these extraordinary leaders," Taylor's message read. "I am inspired by their example, exhilarated by their vision, and encouraged by their compassion and love. And I love them in return."